China will allow the yuan to strengthen much more quickly, in the hope that a stronger currency will be in the best interest of its fast-expanding economy by helping to put the brakes on, analysts say. The central bank already has raised minimum bank reserve requirements twice in recent months to slow lending, which is rising rapidly. China’s gross domestic product rose 11.3% in the second quarter from the same period a year earlier, the fastest in a decade. China will allow the yuan to strengthen twice as fast in the second half of 2006 as it did in the 12 months since it revalued its currency in July 2005, when it broke the yuan’s 10-year-old peg to the dollar, according to a report by Barclays Capital, the investment banking division of UK-based Barclays Bank. China is trying to take measures, including a rise in the yuan, to restrain its record trade surplus, fast-rising foreign exchange reserves and ballooning current account surplus, Barclays says. The Chinese currency has strengthened by only 1.4% in the 12 months following its 2.05% revaluation in 2005. “It is time for China to take prompt action to address its growing external imbalances,” says Huang Haizhou, head of China research at Barclays Capital. “We expect the yuan to strengthen to 7.75 per US dollar by December and for the daily trading band to widen to plus or minus 1.5%,” Haizhou says. The current daily trading band is plus or minus 0.3%. China has repeatedly said that it will allow the yuan to strengthen and trade more freely in due time. That time appears to be drawing closer, as policymakers realize that a strong yuan may be in the country’s best interest. A stronger currency would slow export growth and encourage imports, helping to reduce the trade surplus and reduce foreign currency inflows, according to Barclays. While China has committed itself to developing foreign exchange derivatives markets, it hasn’t done so yet. Chinese companies that want to hedge currency risks onshore can use either forward contracts or the spot market, which traded about $18 billion in the first quarter of 2006, according to the People’s Bank of China. Financial institutions also can use the yuan swap market, which allows them to trade currencies with the central bank. As the 15 foreign and domestic banks that make a market onshore in yuan compete with one another, the ups and downs in the local currency market are going to get bigger and more frequent, Haizhou says. China’s trade surplus reached a record $14.4 billion in June, and its foreign currency reserves are growing at a rate of about $20 billion a month and already are the biggest in the world, having surpassed Japan’s earlier this year. “China’s economy is moving closer to becoming entirely overheated,” says Carl Weinberg, chief economist at Valhalla, New York-based High Frequency Economics. Investment spending in urban areas in the first five months of this year rose 30.3% over the same period of last year. Industrial production and retail sales are both growing at a double-digit pace, he notes. “The government is blaming the bulk of the excessive growth of the economy on the explosion of domestic lending by the banking system to industry,” Weinberg says. The People’s Bank of China raised banks’ minimum reserve requirements to 8.5% of deposits, effective August 15, to slow the growth of credit. Medium- to long-term lending to mid-size companies has risen sharply in the past 18 months, he notes. Raising interest rates hasn’t helped much, he says, because of the country’s lack of market institutions. Raising reserve requirements is more appropriate and more easily achievable in a centrally planned economy, he explains. In addition, banks will pay a penalty rate for lending to over-invested sectors, such as commercial real estate. The government has banned some construction projects outright and has proposed rules to limit foreign investment in residential property. It fears that excessive spending on assets could cause inflation or result in more bad loans on the books of its banks. The number of new construction projects rose 22.2% in the first half of this year. Foreign investment in Chinese real estate rose 27.9% in the same period. Will China Spend Its Reserves? “While a developing country wants to run current and capital account surpluses to fund development, China is demonstrating that it is important not to generate cash inflows faster than they can be used for productive modernization,” Weinberg says. China is more likely to spend its foreign exchange reserves on acquiring productive assets, rather than revaluing the yuan, he says. Revaluation expectations ran high around the time of the one-year anniversary of the initial revaluation in July 2005 from 8.28 yuan to the dollar, but China failed to act this July. The country has been taking other measures to tighten monetary policy in an attempt to lower fixed investment and restrain overall growth. China’s foreign currency reserves rose 34% last year to nearly $819 billion. They passed Japan’s foreign currency reserves of $850 billion in February 2006 to become the biggest in the world and are expected to reach $1 trillion by the end of this year. China’s currency reserves totaled more than $941 billion at the end of June 2006. Economists, including Yu Yongding, who advises on policy as a committee member of the central bank, have urged China to use its foreign currency reserves to buy gold and oil to guard against the risk of a sudden decline in the dollar. The vast majority of China’s foreign currency reserves are held in the form of dollars. Russia, which has fast-growing foreign currency and gold reserves of more than $250 billion, eliminated all currency controls at the beginning of July, making the ruble fully convertible. The central bank, however, will continue to regulate the ruble’s exchange rate at daily auctions. Russian finance minister Alexei Kudrin says that liberalizing capital and currency controls will encourage investment into Russia. If the changes are to have a sustained impact, however, the authorities need to introduce other measures, including adequate reporting on transactions and prudential oversight of financial institutions, according to a report by the Paris-based Organization for Economic Cooperation and Development. The OECD said that making the ruble convertible was a positive step toward strengthening business confidence eight years after the nation defaulted on its debt. While foreign direct investment has risen over the past two years, much of the investment inflows recorded so far probably stem from Russian-owned assets held offshore and reinvested in Russia, rather than from foreign investors bringing fresh capital into the economy, according to the OECD. To fully realize its investment potential, given its natural resources, large domestic market and relatively low wages, Russia needs to cut the restrictions facing foreign investors looking to invest in Russian firms, it says. A draft law on strategic sectors, which may be discussed in the Russian parliament in December, will be a test of the government’s commitment to transparency, particularly in the energy sector, the OECD says. The Bank of Japan raised its key overnight call rate by 0.25 percentage point on July 14, ending its policy of effectively zero interest rates with its first rate increase in six years. Central bank governor Toshihiko Fukui made it clear that the bank would be cautious in making additional rate rises. “We are not embarking on so-called consecutive interest rate hikes,” he told a press conference in announcing the increase. “We will carefully study the state of the economy and prices to gradually adjust interest rates,” he said. The move came despite the fact that Japanese government officials continued to make it clear they would have preferred for the Bank of Japan to wait. The importance of the central bank’s move lies in its signaling impact, Chandler says. The yen failed to strengthen in reaction to the rate increase, he notes, in part because the official discount rate was increased to only 0.4% instead of an expected 0.5%. The central bank’s July report upgraded its assessment of the economy for the first time in five months, saying it was expanding moderately, in contrast to the previous few reports that said the economy was recovering steadily. “We are maintaining our above-consensus bullish view on the yen,” says Bankim Chadha, global head of macro foreign exchange research at Deutsche Bank. “This reflects our continued belief that, besides Japan’s significant current account surplus, the yen remains cheap to fair value, and it therefore has the largest potential to appreciate against the dollar without negatively impacting prospects for economic activity,” he says. Deutsche Bank’s year-end 2006 forecast of 102 yen to the dollar would simply take it to around fair value on a purchasing power parity, or PPP basis, Chadha says. Fair value, or a parity exchange rate, equalizes the purchasing power of different currencies in their home countries for a given basket of goods. The dollar itself is still somewhat cheap on a PPP basis but well above levels that will support adjustment of the US trade and current account deficits, according to Deutsche Bank’s analysis. The bank forecasts that the Japanese economy will sustain 3% annualized growth in gross domestic product for the rest of 2006 but slow to below-potential growth of around 2% in 2007. The Japanese economy appears to be entering a mature phase of expansion and could be affected next year by slower global growth and yen appreciation, it says. 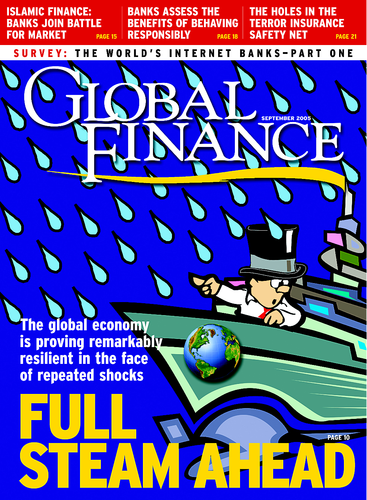 Currency analysts have forecast for some time that the dollar would begin to weaken in the second-half of this year, as the Federal Reserve stops raising interest rates and the attention of traders turns back to the longer-run structural forces related primarily to the large current account and trade deficits of the United States. The upcoming annual meetings in Singapore of the International Monetary Fund and the World Bank also are helping to return the focus to global imbalances. The lower the dollar drifts on a pause in Federal Reserve interest rate increases and anticipation of Fed easing of monetary policy in 2007, the more attention market participants will give to the imbalances theme, Gilmore says. “The US external deficit demands a lower dollar,” he says. Remember, it was the Group of Seven industrial nations, plus Russia, meeting in Washington in April, and Fed chairman Ben Bernanke’s testimony to the Joint Economic Committee of Congress the following week that launched the dollar’s decline in the spring of this year, Gilmore says. Officials then seemed resigned to the fact that the market in time would take the dollar lower against most currencies and that the G-7 should be prepared to check any tendency toward a disorderly dollar decline, he says. “The G-7 meets again in September to revisit imbalances and anoint the IMF as the new global currency cop looking for misalignments and unfair foreign exchange regimes,” Gilmore notes. The weak-dollar trade should make a marked reappearance, he says. Michael Woolfolk, senior currency strategist at The Bank of New York, says the US Treasury’s so-called strong-dollar policy will face its greatest test in coming months as treasury secretary Henry Paulson defines his views on the role of the dollar in correcting the global imbalances problem. While Paulson generally agrees with the benefits of a strong dollar, he acknowledges the need to address the global imbalances problem before it threatens economic and financial-market instability, Woolfolk says. This could imply an end to the strong-dollar policy, he adds. “The challenge for Paulson will be to leverage his considerable experience in China to find a third way on currency reform,” Woolfolk says. One possibility, he says, is to encourage inflationary Chinese policies. Were inflation in China sustained at 10% annually for three years, the yuan would require only a modest 5% annual nominal revaluation to return global imbalances to sustainable levels, according to Woolfolk. “This could begin at the inception of China’s anticipated move to a wider yuan trading band later this year,” he says. Interest-rate differentials are expected to begin narrowing, removing an important element of support for the dollar, Woolfolk adds. Ironically, the greater Bernanke’s inflation-fighting credibility with financial markets, the less he will have to raise interest rates and the sooner interest-rate differentials will begin to narrow. Similarly, the greater Paulson’s China credibility, the more successful he will be at forging a bilateral agreement on currency flexibility and the sooner the dollar will resume its structural decline, he says.